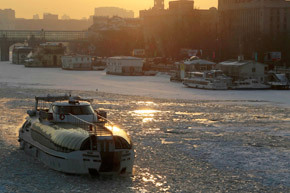 A restaurant riverboat makes it's way along the partially frozen Moskva River in downtown Moscow, Russia, Thursday, Dec. 20, 2012. Temperatures drop to - 20 C (- 4 Fahrenheit). Source: AP.